As many of you might have noticed, I should win worst blogger of the week for being MIA. I have been back in school, 2 classes turned into three, and they are slightly higher on my list of priorities now. I still love all of you, promise. My mom being the good sport she is, was out shopping the other day while I was at school and thought she was being nice by picking me up a couple of packs of cards. I say thought because she grabbed some American Heritage rack packs. I thought about returning both or one of them, but then decided why not open them since I haven't seen any of them yet. I wasn't impressed at all, I got a couple of reprint Jackie Robinson cards, a Firefighter card, and some other random crap. However, there was this card and I swear this Target is the best ever. 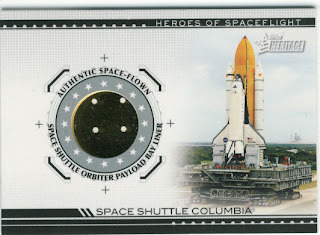 I find this card a little on the eerie side considering what happened to the space shuttle. I have no idea what I am going to do with this card. It was really cool to get something that wasn't a white swatch of a jersey, but it strikes me as odd. Interesting piece of history, but not sure if it's something I really want to keep in my collection. My writing for the Upper Deck blog paid some nice dividends in terms of a hobby box of O-Pee-Chee which I will crack this weekend. Perhaps a live box break, though with no camera. We'll see how it goes, because if for some reason the Yankees are rained out tomorrow night the game may be played as a double header Saturday in which case I'll end up there and not playing with cards. Anyone have any pre-orders in for any boxes? I still need to order a box of Goodwin, I am less excited about the release now only because I haven't really had much time to think about cards in the last week or two. That's a pretty cool card. You can always trade it to Dayf, he loves the space program. I've got 2 boxes of Goodwin on pre-order, and am psyched about it! I look forward to your box break. I need a bunch of cards to complete that set. Nice pull! That's pretty cool that your mom pulled the pack that scored the hit. Cool card, especially coming out of a retail blaster. I majored in history in college and I'm intrigued by the American Heritage cards. I'm not sure if I want to spend the money on them, but I do want to pick up a couple of those space relic cards. Nice pull! That's kinda neat. Definitely out of the ordinary!! I don't care much for the Americana cards (or anything regarding non-sports cards, for that matter), but the odd-ball relics are fun, I guess. Reason #36 why you should never change packs once a selection has been made. My wife does the same thing sometimes, buys a pack that I don't need. I guess it's the thought that counts. I'd be interested in the Firefighter card.